As we approach the Island, branches of enormous trees dripping with Spanish moss reach across the road on both sides, making a canopy of shade above us—perfect for a convertible trip. As we enter Kiawah Island we stop at the guarded gate to get our parking pass and begin our check in to The Sanctuary Resort. More moss-covered trees dot the immaculately landscaped property and golf course, which leads to the resort’s entrance. Before we check in we stop by Southern Kitchen on our drive to The Sanctuary for lunch. This casual eatery specializes in Lowcountry classics and serves breakfast until 4:00 p.m. every day. Toasting our getaway, we sip cocktails, served in Ball jars. I have the Blackened Grouper Sandwich. Crowning this open-faced sandwich is a gorgeous black grouper filet topped with a colorful, tasty avocado slaw and accompanied by a comforting side of creamy pimento mac and cheese. Kevin orders, from the breakfast menu a Bacon Egg and Cheese Croissant. The enormous, light and flaky croissant is piled high with scrambled eggs layered with crisp, pecan smoked bacon, and melted sharp cheddar cheese. The Sanctuary Hotel is exquisite—feels more like a Southern estate than a hotel. It offers 255 spacious rooms and suites. Entering the grand foyer an antique, grandfather clock—appears to be late 18th Century—welcomes guests and reminds us to enjoy our limited time in the magnificent place. On the main level there are three spacious, high ceilinged areas. 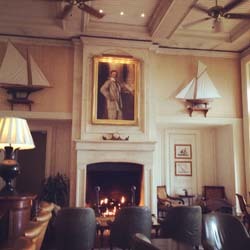 In the center is the main lobby, flanked by the bar and a grand parlor, each with their own massive stone fireplaces. A back wall of French doors connects the three spaces, boasting the hotel’s private views of the Atlantic. And all three rooms are beautifully decorated in a classic, Southern style with colors of the sea against a backdrop of butter colored walls. A wide hallway connects the front of these areas towards two grand, floating staircases, halfway down each hall. Checking into our room at The Sanctuary Hotel, views of the Atlantic Ocean welcome us—not only from the balcony but also from the plush four-poster bed, sofa and chairs in the sitting area, a hand crafted, double sided partners’ desk, and the garden tub in the bathroom that opens to the bedroom with Southern style shutters. We also have the luxury of his and her closets and a dressing table in the alcove between the closets. The dressing table is nestled beneath a large mirror, flanked by scones on both sides, and has a lighted makeup mirror. Each day when I return from our outings, I find that housekeeping has placed a clean, white tablecloth across this table and rearranged the makeup that I left scattered into an organized display of compacts, bottles and brushes. Another special space is our wet bar, which boasts mini fridge (with free water and other food and beverages for a fee), bar sink, and built in glass shelves housing Champagne flutes, wine glasses and bar glasses. And the large bathroom also has a marble rain shower. No detail has been overlooked in The Sanctuary Hotel’s ambiance, amenities, and service—being greeted by name with sincere Southern hospitality at every turn. Our first outing is a Dolphin Encounter, which is just one of the Island’s Nature Program Tours. The Kiawah River is a dolphin habitat, and on this beautiful, sunny day, our tour departs from Mingo Point. Here we board a custom built bay boat driven by our guide, a marine biologist, searching Kiawah’s inlets, creeks and marshes for the Atlantic Bottlenose Dolphin. We learn much about dolphins along the way, including several dolphin myths debunked. And finally we spot one! In and out of the water it swims ahead of our boat, beside our boat and finally nowhere near our boat. On the first night we have a relaxed dinner on Jasmine Porch. This restaurant is located inside The Sanctuary Hotel and has a breakfast porch ambiance, although it is open for breakfast, lunch, dinner and Sunday brunch. Exposed, Charleston brick rises from the oak plank floors, dotted with spacious tables with views through the large French doors, of the swimming pool with its large flowing fountain and the Atlantic. We begin with a bottle of J. Brut Rosé while looking over The Sanctuary’s Executive Chef Brendon Bashford and Jasmine Porch’s Chef de Cuisine Ryley McGillis’ menu, which features Charleston seafood and local, organic products. “A Taste of the Lowcountry” menu offers three courses with suggested wine pairings. Kevin opts for this menu. And I order from the regular dinner menu. Yet we both start with a beautiful bowl of She Crab Bisque, with fresh blue crab and sherry. And Kevin’s bisque is paired with scrumptious Fried Green Tomatoes. Entrees of Grilled Filet Mignon, plus Shrimp and Grits for Kevin and my Roasted Sea Bass arrive steaming hot. The succulent, wild Atlantic shrimp top a bed of organic grits, with sweet peppers, onions, and spicy sausage gravy. And the beautiful sea bass shines with freshness and is filled with flavor. Complementing the fish are new potatoes, fresh asparagus, spring garlic, and a tasty tomato jam. Both entrees are generous in portion, making us wish we could take a take home box—but not going home. Yet we do find room to split Kevin’s delightful Vanilla Bean Creme Brulee with poached pear and biscotti. On the second day it is drizzling rain, so we enjoy a short drive from Kiawah Island to Charleston to site see and antique shop. Charleston is a beautiful city rich in history and historic homes. Here we enjoy lunch in one of the homes converted to a restaurant, Husk, and enjoy their famous cornbread, gigantic chicken wings, catfish, and strawberry tart. The evening is spent back The Sanctuary. Tonight we curl up with a bottle of Champagne and our gourmet cheese platter as a light meal, while it rains torrents outside. Each night we sleep with our balcony doors open. And tonight we are lulled to sleep by both the Atlantic and the steady rain. On our third day the skies are clearer, and no rain. We stop by the real estate office located in The Sanctuary Hotel to get info on the different neighborhoods. Often times we enjoy visiting but would not want to live where we travel. But who wouldn’t love a second home here? And in addition to The Sanctuary Hotel, Kiawah Island also offers The Resort Villas and private homes for rent. Afterwards we drive around Kiawah Island, exploring the residential neighborhoods and stop for lunch at Cherrywood BBQ and Ale—located in one of the gated, golf course neighborhoods, in the Osprey Point Clubhouse. Warm woods envelope the restaurant from ceiling to floor, with wide screen televisions on every wall and views of the golf course and famous alligator pond. From a list of more than 60 local and imported beers, I select a seasonal one, Monk’s Revenge by Terrapin Beer Company—while looking over Chef de Cuisine, Jason Cote’s menu. One sip of this Belgian style, India pale ale, and I know that I have discovered a new favorite beer. The beer is only available here a few weeks each year—lucky me. Kevin decides on the Beef Brisket Sandwich, which has been highly recommended to us, with onion rings. And I order the Free Range Chicken Plate. The tender brisket has been smoked for 18 plus hours and is served on a gourmet bun with pickled red onions. The large, golden onion rings are among the best ever. My brined, hickory smoked half chicken arrives with collard greens and cornbread. This quality skin on bird is moist, tender and flavorful. And the collard greens are better than my grandmother’s. After lunch we take a walk along the beach before my appointment at The Sanctuary Spa. At The Sanctuary Spa, I relax with the aqua retreat, which includes a spacious vitality mineral whirlpool complete with waterfall, steam room and sauna. The spa offers customized treatments employing botanical extracts, nourishing seaweed, mineral-rich mud and natural enzymes. I opt for the “Natural Face Lift,” which is an herbal enzyme resurfacing treatment followed by an infusion of a Plant Stem Cell Serum to slow cellular aging. A Beech Tree & Ginseng Moisturizer ("The Natural Botox") plumps and firms the skin, while ultrasonic and micro-current technology increases product penetration and stimulates collagen renewal. During the treatment I enjoy a neck and shoulder massage. And afterwards, my skin is visibly firmer and smoother, and I have never been more relaxed. 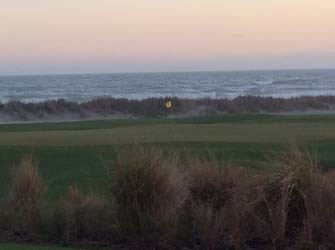 Kiawah Island may be most famous for its golf courses. Neither of us plays golf but enjoy being surrounded by the beauty of 90 holes of championship golf, on five golf courses. The Ocean Course is one of only four courses in the U.S. to have hosted every major PGA event in the country. We spend our last evening having dinner at sunset in The Atlantic Room. As Kiawah’s premiere seafood restaurant, each comfy seat is upholstered in gold and is situated to overlook both the famous The Ocean Course and the Atlantic Ocean. I recall the sunsets from here on our last trip. And tonight’s is even more beautiful. Watching golfers putt their 18th hole, we enjoy cocktails of Desert Rose and A Hole in One, before dinner as the sky turns all shades of pink, red and purple as the sun slowly melts beyond the dunes and fairway. Chef de Cuisine, Jonathan Banta’s menu delights both surf and turf fans. We both opt for the Lobster Cocktail. Martini glasses are filled with—crisp on the outside and succulent on the inside—tempura encrusted lobster with aji amarillo aioli, mixed with a fresh avocado and tomato salad, which adds a creamy acidity and additional layers of flavor to the dish. Tonight Kev selects turf, ordering a bone in rib-eye, which is tender, juicy and cooked to order—atop a bed of mashed potatoes asparagus and spinach. And I am surf, ordering the American Snapper. 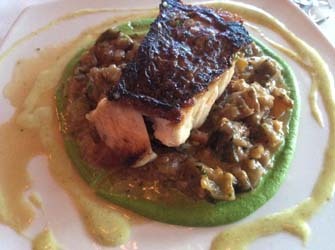 This gorgeous piece of fish is plated with sweet pea puree and John's Island Ratatouille. And we end the evening with two divine desserts of Kahlua Semifreddio and Peanut Butter Panna Cotta, paired with glasses of Taittinger Champagne—toasting a wonderful trip with a promise to each other that we will come again soon.